11/11/07, The Dakota: On a Sunday night at the Dakota soon after daylight savings time kicked in (the bad end of DS time, when it gets darker earlier), Lowell Pickett and the staff at the Dakota threw a party for A-Train members. They treated us to light appetizers and music and it was lovely. Sets by Sam Miltich and other members of the Clearwater Hot Club bookended a teaser set by Rondi Charleston and two members of her band, who would appear at the Dakota on Monday and Tuesday. I forget how much I enjoy hot club music until I'm sitting in a room where it's being played well. It all looks so easy and relaxed, and it sets such a convivial mood. 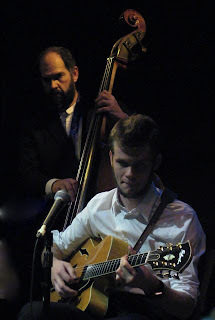 Miltich, the wunderkind who first learned to play the guitar at age 13 and almost immediately started channeling Django Reinhardt, was joined by his dad Matthew Miltich on bass, Mark Kreitzer and Rob Henry on rhythm guitars, and Dave Karr on saxophone. Both Sam and Dave wore red socks. Sam introduced his father as Leo Tolstoy; you can see why from the photograph. During their second set, violinist Mark O'Connor walked in and said hi. He had played Orchestra Hall that afternoon with Sharon Isbin. We were all hoping he'd brought his violin but he hadn't. With Bruce Barth on piano and Rufus Reid on bass, Rondi gave us a nice selection of standards: "No More Blues," "I Believe in You" (from How to Succeed in Business Without Really Trying), "Bewitched, Bothered and Bewildered," "Shall We Dance." It was another light appetizer, a taste of what to expect when we returned the next day. Photos: Sam Miltich and Matthew Miltich; Rondi Charleston and Rufus Reid. Back when Sam Miltich was 18, NPR did a story about him.